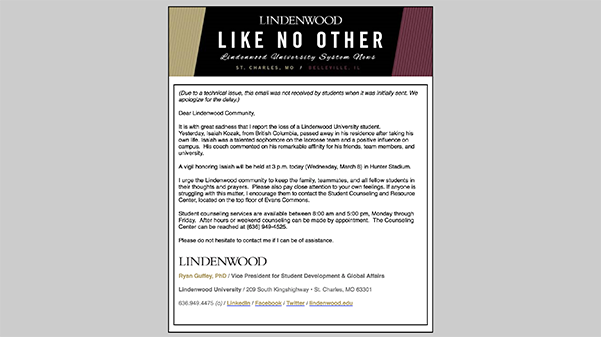 A Lindenwood student died suddenly on Tuesday afternoon, but the university’s student body was not notified until almost 24 hours later. Faculty and staff were sent an email notification about the incident around 8 p.m. Tuesday. Students did not receive the email until shortly after 2 p.m. the next day. “Students were supposed to be informed at the same time as the faculty and staff, but the student email did not land as planned because of a mistake,” Public Relations Coordinator Chris Duggan said. He added he was not aware of the issue until Wednesday morning. Previously, an email notification about an alleged sexual assault in campus housing was sent to faculty on staff on Jan. 23. Students did not receive the email until the next day.